Although it’s only a couple of hours away, I’ve never spent much time in Birmingham, the UK’s second city. Now, thanks to a recent acquisition by my company, I’ve spent more time in a place I never thought I’d visit, Birmingham Alabama. Not that it’s particularly easy to get to. 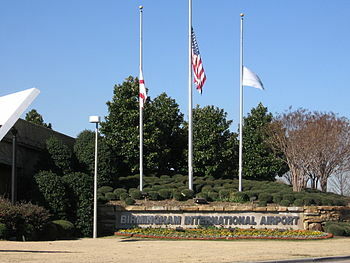 Despite the nomenclature, I couldn’t find a single International flight heading into or out of Birmingham International Airport, not even to neighbouring countries like Mexico or Canada. In the absence of direct flights, connecting flights are the order or the day which means a very long journey from the UK. I don’t know whether I’m especially unlucky, but when you have flight connections in the States, you only have a 50:50 chance of making it to where you intended when you intended. The scope for things to go wrong (weather, mechanical failure, long immigration queues, airline incompetence) seems immense. How native US citizens put up with it is beyond me. I didn’t know much about the place before I got there and a quirk of fate gave us a free day during our business trip. As we were in the centre of town, we picked up a tourist map from the hotel and set off on foot. The closest destination picked out on the map was the Peanut Depot. We had no idea what to expect but thought if it’s on the map, it must be worth a visit. When we found a shop selling peanuts, we assumed there must be more to it. A quick scan around the place told us that the only other thing worth noting was a plaque on the wall proclaiming it a historic building at 115 years old. If that’s what defines a historic building, half the buildings in the UK wear similar plaques. The next entry on the map was a tower. When we got there, we realised it was just an office block. A tall office block, but an office block all the same. Clearly, we needed advice. Luckily, the next destination on the map was the tourist information office. Upon arrival, they greeted us enthusiastically and insisted we sign the guest book. Although there was no dust on the guest book, the previous entry predated ours by some margin. The friendly people directed us to the Civil Rights Institute. Inside the foyer of the Institute, we spied a display case containing something both sinister and ridiculous; a Ku Klux Klan outfit donated by an anonymous donor. Wandering through the exhibits was enlightening but also shocking. It’s hard to imagine mistreatment of a whole race on such a scale barely 20 years after World War 2 and only 50 years ago. Birmingham city centre is a lonely place. We hardly saw a soul and we walked around for hours. There is a staggering dearth of people given that there are over 200,000 residents. As so few Alabamans seems to walk anywhere, it’s also surprising to find so many cobblers. I have subsequently stayed outside of town where bizarrely, there is more going on. The scenery’s amazing. There are more bars, more restaurants, more shops and more people. The people in Birmingham are very friendly. They did try to poison me once with something called a peanut butter & jelly sandwich. A vile concoction of sweetness and ungodly textures contained between two slices of bread. I’ve forgiven them, for now, but I will be deeply suspicious of any strange-sounding fare from now on!